Jacob is using Smore newsletters to spread the word online. This is a war dove because he is putting a flower in the barrel of gun. 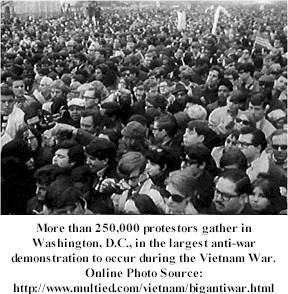 250,000 protesters gathered at Washington D.C in the largest anti-war demonstration to occur during the Vietnam War. I think they were right at that time African-Americans shouldn't have fought for the U.S. because the U.S. was still racist at the time it wasn't until after Vietnam that blacks got full civil rights. At Kent State University there was a protest that ended in 4 students dying because of what they believed in. 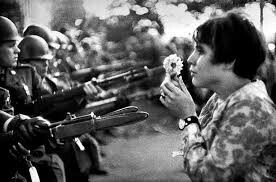 Woodstock is a protest with music to make everyone believe what they believe and also to express how they felt about the war. Some veterans thought they fought in Vietnam for nothing because we didn't win. Veterans thought their medals meant nothing because we didn't win. The anti-war protests begun on college campuses. The launch of the Tet Offensive begun the most intense period of anti-war movement. The Pentagon Papers that exposed what the government and military were actually doing in Vietnam made Americans wonder whether or not they should trust the government. Tensions ran higher than ever, Vietnam triggered mass demonstrations and incidents like at Kent State when National Guard troops shot into a group of protesters killing four students. I chose anti-war movement because I was interested in their point-of-view on the war deeper than just saying they were against the war. Because hippies used drugs I was interested about what they thought about our leadership.